I had the amazing opportunity to volunteer with Camp Banyan during one of their cooking classes! We worked with all of the young people to prepare, create, and then eat a DELICIOUS meal including baked ziti, chicken, roasted potatoes, and finished it off with hand decorated cupcakes! It was such a joyful experience and working with the campers is a really enriching opportunity. This camp has made such an impact on these young adults’ lives, as it teaches them important life skills that will h elp them to make it on their own! This cooking class is especially one of the fan favorites among the campers, because they get to enjoy the fruits of their labors. They LOVED feasting on the delicious meal they made themselves, with the help of Chef Laura and our other lovely volunteers, and they walked away with skills they will use for the rest of their lives! 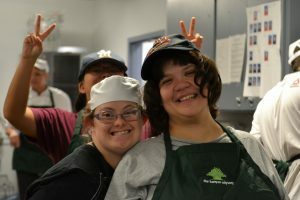 When asked to comment on her time with the campers at Camp Banyan, Chef Laura spoke her heart, telling us “this has been honestly one of the best experiences I’ve had in my life. These young adults are amazing! They’re open, they’re honest, they’re loving, and my heart is just completely overwhelmed right now!” Thank you, Chef Laura, for your willingness to be here and teach and love on the campers with us! Working with this amazing group of young adults is a life-changing experience that all would be lucky to partake in! Despite everything life has thrown at them, these are some of the happiest and kindest people I have ever met, and every minute with them is precious. It is easy to say that working with The Banyan Odyssey is just blessings upon blessings, and anyone who is interested in assisting in the camp’s many events, please reach out and contact Banyan! Your life will be forever changed as soon as you meet these young adults! For more pictures and fantastic videos (from our spectacular photographer Michele Hurm!) from our amazing 2-day cooking class, check out our Facebook or Instagram!